← Is the Flinders St Station design competition just about…..design? Has the Grattan Institute got the answer to our housing woes? I have to say right up-front that I’m disappointed by The Grattan Institute’s new report, Getting the housing we want. It nominally proposes ways of increasing housing supply in established suburbs, but it really just puts up the politician’s standard solution – more bureaucracy, more money, and little explanation (press report here). In the Institute’s defence, I must acknowledge that it’s taken on a difficult task. It’s much harder to propose practical solutions than it is to analyse problems, identify key issues and propose general directions for action. And the Institute has hitherto done a good job on the latter three tasks with a series of reports under its Cities Program. The new book by Harvard economist Edward Glaeser, Triumph of the City, illustrates the way solutions attract criticism. The book was lauded for its sophisticated analysis of the benefits of density and the need to remove the many obstacles to redevelopment. But his big idea for an historic buildings preservation quota – meaning that cities could only protect a set number of buildings each year and so would be forced to prioritise – was lambasted by all and sundry as impractical and, worse, naïve. A lot of critics had a similar reaction to Ryan Avent’s The Gated City. Great analysis of the need to promote density, they said, but potential solutions to NIMBYism like developers compensating neighbours for the negative effects of development were criticised as unworkable and unrealistic. As soon as detailed, practical solutions are suggested, the knives come out! So the Grattan Institute is putting its corporate head on the line with the solutions-oriented Getting the housing we want. It’s a follow-up to the Institute’s earlier report, the impressive The Housing we’d choose. The earlier report established that there’s a significant mismatch in Melbourne and Sydney between where many people actually live and where they’d like to live (see my earlier discussion of this report). Opposition from existing residents to redevelopment proposals is a key reason for this misalignment – they don’t see the broader good and they don’t see how redevelopment benefits them. Councils tend to fall in behind residents who’re committed in their opposition to redevelopment. The new report is on safe and familiar ground when it advocates standard stuff like code-based approval processes for small-scale development. However its headline proposal is more problematic – the Institute proposes the establishment of Neighbourhood Development Corporations (NDCs), with initial financing coming from a proposed new Commonwealth-State Liveability Fund. The idea is NDCs would undertake large scale redevelopment projects aimed at increasing housing supply. NDCs would be “independent”, not-for-profit organisations that work in “partnership” with all tiers of government, the private sector and residents. The Institute stresses the importance of in-depth consultation and says NDCs could only “go ahead with the support of local residents”. NDCs would have to provide a diversity of housing “in terms of both type and price” and would have “temporary planning powers”. Disappointingly, there’s not a lot of concrete information in the report on the mechanics of the proposed NDCs and Liveability Fund. And there’s little specific analysis and justification provided in support of these ideas. However the report profiles three examples of existing organisational structures similar to what’s envisaged with NDCs. These are London Docklands Development Corporation; HafenCity Hamburg, and Bonnyrigg social housing estate. These throw more light on what the Institute envisages. They make it clear NDCs are conceived primarily as mechanisms for managing large sites like E-Gate which are invariably disused, underutilised or owned largely by government. The familiar redevelopment challenges of land assembly, existing uses and resident opposition are usually much more tractable with these sorts of sites than they are with activity centres (e.g. see discussion of proposals for Ivanhoe). I have trouble enough with the idea that changing management structures is the broom that will sweep away all the gunk that’s holding up supply. But the trouble with having such a narrow ambit is that the potential contribution NDCs can make to increasing housing supply is necessarily more limited. Moreover, it begs the question of whether NDCs are even necessary. As I’ve pointed out before, so-called surplus sites can only make a relatively small contribution to increasing dwelling supply in established suburbs. 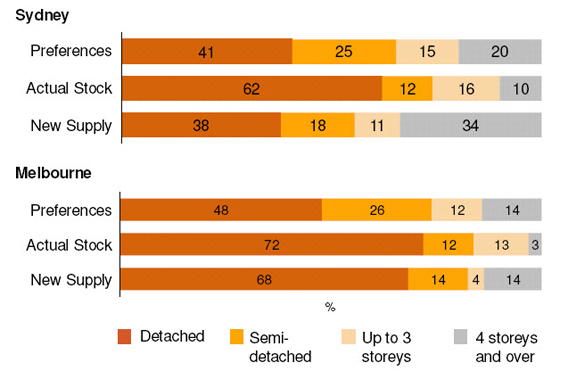 For example, this report says brownfields sites only delivered 40 ha per year of land for residential use on average over the last ten years. In any event I don’t think it’s obvious that NDCs are necessarily a better way of managing these sorts of projects than current arrangements i.e. where the State manages a project such as E-Gate through Major Projects Victoria or through an organisation like the amusingly named Places Victoria (formerly VicUrban). I know it’s a cliché, but NDCs really do look like another layer of bureaucracy. In fact they could be worse – all those competing interests could be a recipe for achieving nothing. And being “independent” is no good if it means having no power. According to Melbourne 2030 and many planners, what we really need to do is increase dwelling supply in existing activity centres. But I don’t think NDCs can contribute a lot here. I can see a case for taking responsibility out of the hands of local government because it’s too frightened of offending residents, but giving it to an NDC looks like going from the frying pan into the fire. Insofar as governance is the issue, I’d look first to other approaches, such as larger local government areas, like Brisbane City Council. The former Transit Cities Program might be another prospective model. A key function of the proposed Liveability Fund would be to give residents an incentive to accept higher densities in their neighbourhood by compensating them with improved infrastructure and amenities. Whatever the merits of that idea, such funding could also be provided under existing arrangements. Setting up a new structure would be over-kill. However it were done, the Liveability Fund has its own set of issues. Throwing money at problems might be the oldest trick in the political book, but the funds still have to be found – other, possibly more worthy, expenditure must be foregone, or taxes increased. Just what level of capital and operating expenditure would be required to “compensate” residents who’re convinced they’re about to be blighted by noise, traffic congestion and limited access to parking is an interesting question. I suspect it would be a lot. The Institute has enormous faith in the power of consultation. However if there’s a will to improve the quality, depth and conviction of consultation, it isn’t necessary to create a new organisation. Conversely, creating an NDC won’t guarantee the quality of consultation or the will for it. As I said at the start, it’s hard to put forward a specific solution that others won’t find fault with. Where I have most trouble with this report, though, is in the lack of analysis and evidence to support the proposed NDCs. The report reminds me of how politicians respond to issues – propose a new body, propose some dollars, check the boxes and away you go. And go light on the detail. New administrative structures might well have a role in any solution to the supply problem, but they’re the tail, not the dog. There’s not enough bite in this report. There’s more to this report, including a proposal for a small development design panel and ways to match housing stock with household composition, but I’ll have to return to them later. But hang on, aren’t you doing precisely what you’re being critical of? Criticising without offering your own solutions? Yes, but, but, but……..there’s an enormous difference between a part-time blogger and a research institute with full-time staff. It’s a couple of person-hours vs a couple of person-years devoted to the Grattan’s Cities Program. More to the point, this is Grattan’s job, it’s mission! My job here is to “review the book” not to write it. Nevertheless I have made various suggestions for action which are scattered across the site (although I haven’t written a post specifically dedicated to the topic). As it happens I have recently written up an idea which I’ll post shortly – I allude to it in the last para of this earlier post. I’m yet to read the report, but from the sounds of things NDCs would essentially be a bunch of separate committees dedicated to brownfield sites. I agree, this isn’t going to provide too much of a benefit to anyone. As you have pointed out one of the biggest problems with housing ability is land assembly. Overcoming this problem will always be quite difficult under the sort of political system Australia has, but NDCs don’t seem to address this issue at all. As far as ways to overcome land assembly I can’t offer much insight apart from a suggestion I read to offer opportunities to either sell or become a “shareholder” in the redeveloped site. That way property owners would still have to vacate, but could get an ongoing return from investment in the site. Back in the 80s I did a study for the NSW Govt of the residential land pooling scheme operating in WA at the time. There were issues with hold-outs but, IIRC, a key problem was landowners effectively became developers and so carried a lot of risk. The umbrella organization theoretically accepted that housing density could be increased adjacent to minor shopping centres, but the restrictions they wanted effectively made it impossible. What is needed is to remove all planning controls from councils, other than, perhaps, change of use from agricultural land or the like to residential. No restrictions on subdividing blocks, no restrictions on block size, no requirements for car parking spaces, no restrictions on heights, no requirements for set backs or minimum frontages, no requirements for wasted space to the sides. No restrictions on granny flats, no restrictions on using letting rooms on a bed-sit or other basis. Corruption in local councils starts with planning restrictions – Wollongong, Tweed Shire, and probably others – though there was no corruption proved in Tweed (not even a suspicion of any), just the thought that some of the councillors had links to developers. Remove the restrictions and you do two things, you enable the market to operate freely, and you remove the gains to anyone wanting to do an undercover deal. Both are extremely desirable. While I am in agreement with your sentiment that the controls might be too tight, abolition of councils’ roles in planning probably won’t solve the problem. Planning is always matters of degree – putting the abattoir next to the kindergarten clearly isn’t the right answer, but what about the factory/shop/house/park etc. Where do you draw the line? At some point, somone/body has to make the decision and whether it is a council or some other organisation probably isn’t he issue – it is more about the rules they work within. While a benevolent dictator can decide what is for the public good, in a democracy it is often the public who do that, even if we think they’ve got it wrong.